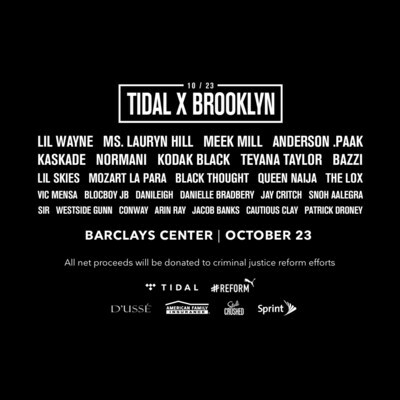 NEW YORK, Oct. 10, 2018 /PRNewswire/ — Today, global music and entertainment streaming platform TIDAL announced the lineup for the 4th Annual “TIDAL X: Brooklyn” philanthropic concert will include performances from Lil Wayne, Ms. Lauryn Hill, Meek Mill, Anderson .Paak, Kaskade, Normani, Kodak Black, Teyana Taylor, Bazzi, Lil Skies, Mozart La Para, Black Thought, Queen Naija, The Lox, Vic Mensa, BlocBoy JB, DaniLeigh, Danielle Bradbery, Jay Critch, Snoh Aalegra, SiR, Westside Gunn, Conway, Arin Ray, Jacob Banks, Cautious Clay and Patrick Droney. This year’s performers are coming together to support criminal justice reform across the country. Thanks to this year’s sponsors including Puma, D’USSE, American Family Insurance, Stoli Crushed, Sprint and Barclays Center, one hundred percent of net ticket proceeds and donations will support criminal justice reform non-profit organizations such as #Cut50, Equal Justice Initiative and Innocence Project and REFORM. Fans worldwide can learn more, purchase tickets, make donations and tune-in to the show’s livestream on October 23rd here: TIDAL.com/BROOKLYN. TIDAL X: BROOKLYN furthers TIDAL’s commitment to supporting philanthropic endeavors and key social issues that the music community is passionate about, including Lil Wayne’s Social Wave For Change, T.I.’s TIDAL X: Money Talk Education Challenge as well as social justice initiatives from A$AP Ferg, The LOX, Damian Marley, Dec. 99th and more.